Adolphus Rice first reached Houston grocery shelves in 1938 and quickly became a family tradition. Adolphus Rice is always superior flavor and texture and long recognized for its outstanding and consistent quality. Adolphus Long Grain Rice is produced from a select variety of quality Texas grown rice to ensure its’ consistency of flavor, appearance and texture. Adolphus contains a maximum of 4% broken kernels, is fully enriched, and meets the stringent standards of USDA No. 1 classification. It cooks to a fluffy, tender texture every time. 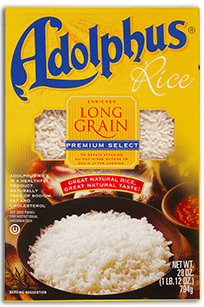 Adolphus Long Grain Rice is sold in Texas and surrounding areas, and is shipped fresh from our Freeport, Texas mill. One cup of uncooked rice yields about 3 1/2 cups cooked rice. 1. Measure 2 cups water, 1 cup of rice and (if desired) 1 teaspoon salt and 1 tablespoon butter or margarine into a large saucepan. Bring to a vigorous boil. 2. Turn heat down very low, cover with a tight fitting lid, simmer without lifting lid for 15 minutes. 3. Remove from heat and let stand covered for about 5 minutes. Fluff with fork and serve. For drier rice, use slightly less water. 1. Refer to above chart for desired number of servings. 2. Measure all ingredients into a 2 to 3 quart microwave-approved dish. 3. Cover and microwave on high for 5 minutes or until mixture comes to a boil. 4. Reduce heat to medium (50% power) for 15 minutes. Remove from microwave and let stand 5 minutes. Fluff with fork and serve. NOTE: Microwave ovens vary. Cooking times are approximate. Long Grain Rice, thiamin (thiamin mononitrate), iron, (ferric orthophosphate), niacin, folic acid (folate).